One page: See EVERY building product manufacturer in North America investing in product transparency, from EVERY material ingredient disclosure program and EVERY program operator – more than 1060. 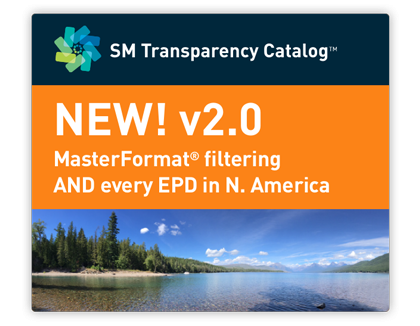 One place: Now the single source for ALL EPDs for building products used in N. American: 9 program operators, 1790+ EPDs from 625 manufacturers in 20 MasterFormat divisions. One click: Find EVERY brand investing in product transparency in each MasterFormat division and section. AECOs aren’t looking just for disclosures, they’re looking for greener and healthier products with disclosures. SM is making it super easy for AECs to find & specify. Find ALL products from one or more of the MFR’s brands, with all the associated transparency disclosures, organized by MasterFormat section – on one page. The products link to product pages on the MFR’s web site, where they want AECOs to go, eliminating the need to manage a lot of content someplace else. Do great demos online, at lunch & learns and on a tablet on-site. MasterFormat filtering, aligned with MasterSpec sections, lets AECOs source products and disclosures for a project, office master and submittals. Be knowledgeable about product transparency, understand what the disclosures mean, how to use to meet rating system requirements and tell the stories about what the MFR is doing to improve – to get products into the spec. The purpose of the Transparency Catalog is to help accelerate the transformation of the built environment. It is the most inclusive product transparency solution in the market. Designed, curated and continually updated by Sustainable Minds customer experience and product transparency experts, the Transparency Catalog delivers the best user experience throughout the construction process, from design to build. It’s free to use, no ads, no login and no selling data or analytics, ever. “This version signals that product transparency is reaching a tipping point. There are enough MFRs across the majority of commonly used MasterFormat divisions for filtering to provide a great user experience. The close relationships with our MFR customers, and their customers, allow for a continuous collection of feedback. This product has been researched, road-mapped and developed based on a deep understanding of what will bring value to all users in this industry,” said Terry Swack, Sustainable Minds Founder & CEO. Transparency is the new green meant to drive building product transformation. Product transparency refers to two types of technical studies manufacturers create to assess the life cycle environmental performance and material health of their products. These are performance criteria now used to help make decisions about products. For the MFR, conducting these evaluations means considerable time and money. However, this is the only way to understand where impacts, hazards and risks are occurring. These studies first and foremost provide MFRs with key information and insights for product improvements and innovations. Six green building rating systems in North America now offer credits for installing products from MFRs that have disclosed the findings of these studies. Rating systems incentivize AECOs to specify products with transparency disclosures with the ultimate goal of being able to select actually higher performing products that result in higher performing buildings. With nine EPD program operators and 10 material ingredient programs with disclosures eligible for green building credits, building professionals are spending tremendous amounts of time sourcing products for green building projects and still cannot find what they need. Organizations of all sizes are updating their office master specifications and want to include requirements for products with transparency information. However, these products are not yet identified as such or even included in current specification tools. As the demand for green building increases and product databases proliferate, teams are using multiple solutions to research greener and healthier products. Each database has different criteria for inclusion, different business models and different privacy and data use policies. This has also meant that MFRs must devote resources to submit and manage product data in locations other than their own web sites. Education, awareness and enthusiasm for greener and healthier products continue to grow, but for mainstream adoption, tools must be easy to use and easily integrated into current workflows. With so many sources and types of disclosures, there is a need to simplify, consolidate and digitize. Design and technology can solve for time and cost efficiency. People should expect better tools. Finding brands and products with transparency disclosures in one place means people can then apply their own selection criteria. Getting everything all in one place and making it easy to compare is the first step. Because Sustainable Minds is a program operator with the intent to make environmental reporting simpler, more understandable and meaningful, there is no other organization that has the business interest and capability to collect, categorize and curate these documents and make it possible for AECs to easily find and specify products across a wide range of MasterFormat divisions in the effort to build truly higher performing buildings. – Brian Wolf CCS, CSI, LEED AP BD+C, VP Specifications at Grimm and Parker Architecture. Sustainable Minds environmental product transparency cloud-based applications, data and services help product manufacturers design and market greener products. Launched in 2009, SM Eco-concept & LCA software was the first streamlined LCA tool for industry and education, now used in more than 90 countries worldwide. In 2013, the company introduced its award-winning SM Transparency Report™, an innovation in ISO 14025 Type III environmental declarations (EPDs) and became a program operator expressly to develop standardized environmental reporting guidance and tools that make product transparency easier, understandable and more effective. Sustainable Minds is dedicated to operationalizing environmental performance in mainstream product development and manufacturing in an understandable, empowering, and credible way. Its easy-to-use standardized solutions make it possible for manufacturers large and small to drive revenue and growth through greener product innovation. Trademark Legal Notice All product names, logos, and brands are property of their respective owners. All company, product and service names used are for identification purposes only. Use of these names, logos, and brands does not imply endorsement. Sustainable Minds® is the registered trademark of Sustainable Minds, LLC. All other trademarks cited herein are the property of their respective owners. Sustainable Minds is offering webinars to provide an overview of new v2.0 capabilities.